I’ve always had a soft spot for the movie “The Princess Bride”. Then when my husband and I got married we made reference to the book at our ceremony so we never officially declared it, but the movie sort of became “our” film. 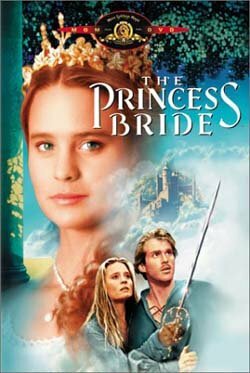 So obviously we did what any reasonable married couple would do with such a special film, we invited our friends over for “The Princess Bride”: The Drinking Game. Yes my friends, you read that correctly. 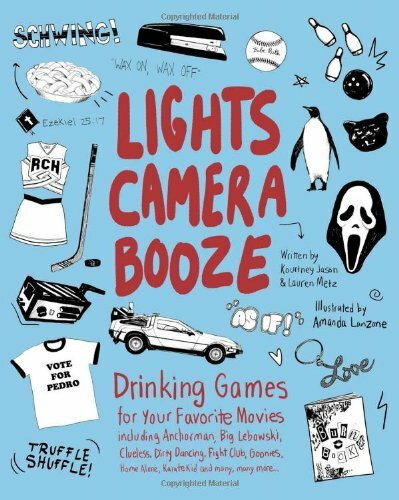 I received a review copy of “Lights, Camera, Booze: Drinking Games for Your Favorite Movies” by Kourtney Jason and Lauren Metz and illustrated by Amanda Lanzone, and you can’t get a book like that and not take it for a test drive. There were tons of tempting options: “The Goonies”, “Back to the Future”, “The Rocky Horror Picture Show”, “Clerks”, “Fight Club”, “Monty Python & the Holy Grail”, and so many more! Yet when everything was said and done my husband and I picked “our” movie, “The Princess Bride”. With the difficult decision of film picked out, we all gathered and prepared for the fun. 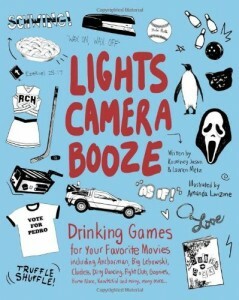 “Lights, Camera, Booze” tells you when to drink. In this case, drink when…. 15. Westley defeats a foe. Each movie, along with the “drink when”, has a cocktail paired up with it. For “The Princess Bride” the drink is the True Love Cocktail. A mix of coconut rum (RUM! ), peach schnapps, and cranberry juice. The first few to try it proclaimed that it “tasted like college” and others agreed. It was pretty sweet and needless to say, tasted better the more you had. Being the super hostess, I had provided potato chips. I refer to them as fried sliced potato tapas. Fortunately a few of our friends had other things in mind. One friend brought roasted in the shell peanuts (“Anybody want a peanut?”), and snack size Snickers (to emulate the oversized chocolate Miracle Max pill). A different pair brought beer bread (Yum!) and M.L.T.s, yep, mutton, lettuce, and tomato sandwiches (Miracle Max’s favorite!). They were DELICIOUS! The book stresses that when you “drink”, it’s a sip, not a pounding back the whole glass. Although even with that rule in place most of us thought we were in trouble with just the plot background at the start of the film. We were like, Buttercup, quit saying Farmboy and for the love of God Westley, shut up on the “As you wish”! Depending on the size of the glass, some folks were refilling by the time Buttercup was vowing she would never love again. It was ugly and it was HILARIOUS! We all had a great time and when it was over I shared the trivia that “Lights, Camera, Booze” provides. They also have a game, which for The Princess Bride was a toy sword fight. Being adults, full of True Love Cocktails, in our crowded apartment; we opted to pass on the game. There’s also a Hot Topics section with some conversational questions which I totally forgot about and by this point my friends wanted to go through and look at other movies. By the end of the evening people were talking about what the next movie/drinking game night should be and what other movies should have been in the book. With that in mind, I would give Jason & Metz’s “Lights, Camera, Booze” two thumbs up, way up.